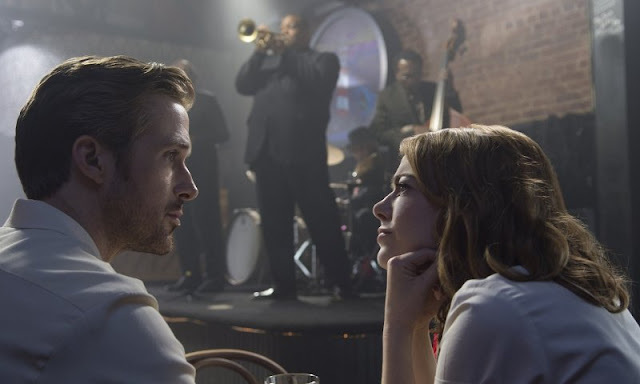 La La Land is a comedic musical drama about a musician and an actress who inadvertently and inexplicably cross paths on their way to fame. The film was written and directed by Damien Chazelle (Whiplash) and features acting performances from Emma Stone, Ryan Gosling, J.K. Simmons, Rosemarie DeWitt, Callie Hernandez, Finn Wittrock, and John Legend. Well, hello there Hollywood, you definitely like to show off when you know you have something special on your hands. 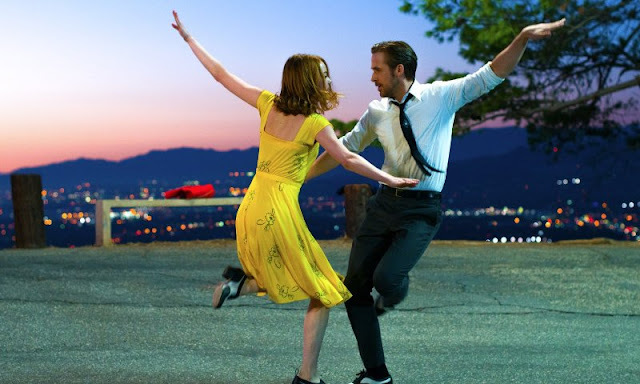 Damien Chazelle has created an homage to the tinsel town era where singing and dancing was as much a part of the cinematic experience as computer generated special effects are today. From the opening number, you know this film is going to be something special as the whole thing is filled with such a wondrous mix of lights, colors, and sounds. As the story begins to unfold, you can't help but get swept up in the unmistakable melodies and magical moments that are only accentuated by such beautifully conceived cinematography. Chazelle really does shine when it comes to how he visually emphasizes mood and emotion with a brilliant mix of colors and shading. Every frame of film is meticulously thought out, every prop is perfectly placed, and the cast is spot on with every single line of dialog. If I was to point out one flaw, I thought the movie was a bit long and really sagged during the transition from the second to the third act. It starts off big and bold and colorful and promises something truly spectacular all the way around and it nearly delivers on that promise if not for what I felt was a little too long of a trip down into the dark and muted tones of the story. Sure, you kind of have to go there to get to the end, I just felt like it could have been trimmed down a little to keep things moving along at a better pace. 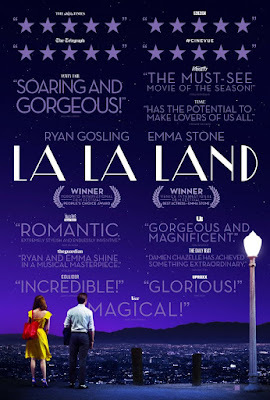 After watching this film, a good friend of mine stated simply, "Tonight, I fell in love with Emma Stone." Seriously, it's hard not to have emotions about such a beautiful and talented young woman when she is performing at the level she has been of late. A couple years ago, she nailed her supporting role in Birdman and elevated herself to being one of the premiere actresses working today. In that film, she showed a range of emotion and a flair for the dramatic while, here she lets loose and literally dances her way into our hearts with a style and grace that matches the film and story every step of the way. Meanwhile, Ryan Gosling continues to cement his place as one of Hollywood's hottest heartthrobs with a well rounded effort that dazzles, delights, and digs deep into the past in a way that reminds you of someone like Carey Grant while in his prime. He gives his character the same effortless style and star power that Jean Dujardin so perfectly put into his performance as the iconic silent film star George Valentin from Michel Hazanavicius's The Artist. I actually thought about that movie a lot as I watched Chazelle's film unfold and it almost felt like a dressed up and domesticated answer to it in a lot of different ways. 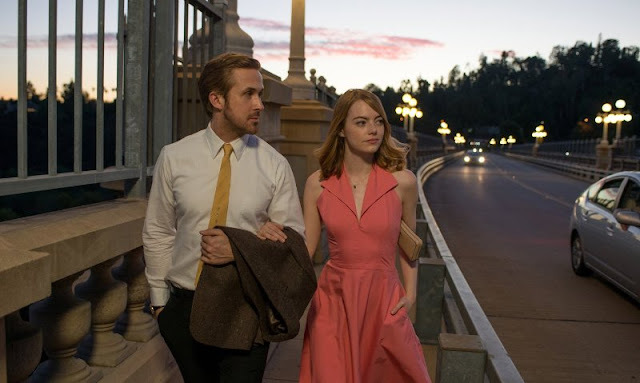 La La Land is a fantastic bit of film making that the critics are going to fall all over themselves as they praise it to no end. 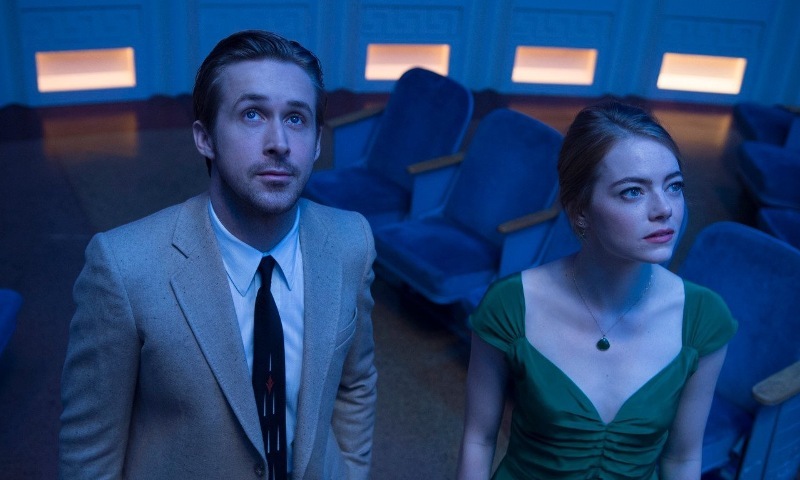 Stone and Gosling give Oscar caliber performances and at least one of them could and probably should walk away with a gold statue when the time comes. 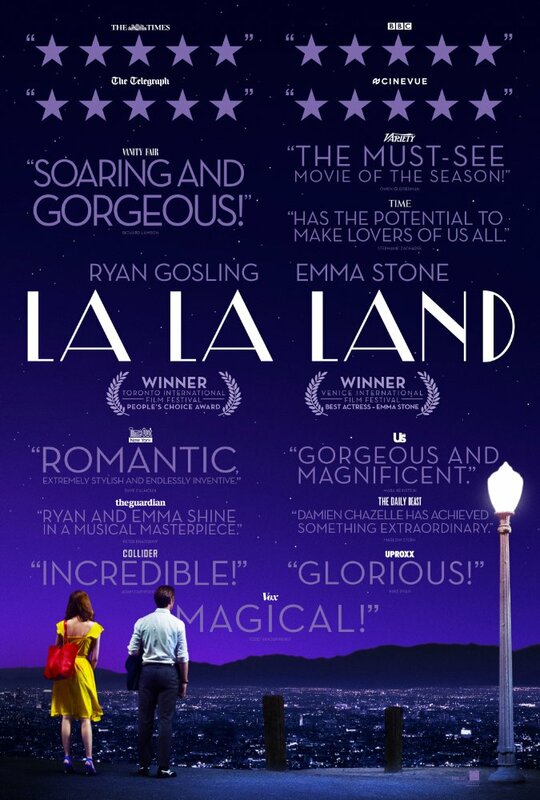 Damien Chazelle is definitely on a roll with two rock solid and highly entertaining films under his belt and I can't wait to see what he might have in store for us next.